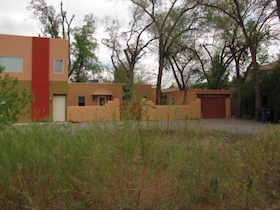 Acequia Jardin is a small cohousing community in Albuquerque, New Mexico, that encourages interaction with neighbors. Home ownership includes a share in the community garden and use of the guest caseta, community room and common lands. Acequia Jardin holds discussion groups, yoga classes and community meals, and residents volunteer for tasks within the community. Homes designs are 800 to 1200 square feet and are energy efficient. Within walking distance of the community are shopping, parks, library, and a community center.